Gorongosa National Park, in central Mozambique, is perhaps Africa’s greatest wildlife restoration story: a 20-year Public-Private Partnership between the Government of Mozambique and the Gorongosa Restoration Project, a U.S. non-profit organization. By adopting a 21st Century conservation model of balancing the needs of wildlife and people, we are protecting and saving this beautiful wilderness, returning it to its rightful place as one of Africa’s greatest parks. Why is the Gorongosa Restoration Project important? Gorongosa National Park is a place of astounding diversity and acts as a refuge for wildlife and plants. This park is also the crown jewel of Mozambique’s park system and is a source of pride for the country. Without protection, the earth’s remaining wild places, such as Gorongosa, would be lost forever. 1) Tourism: By developing tourism, we create employment for local people and generate sustainable revenue for the Park. 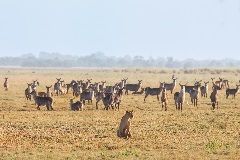 Every guest that visits Gorongosa plays a vital role in this amazing conservation effort. 2) Conservation: By protecting Gorongosa’s wildlife and landscapes, we make sure future generations have a chance to experience this special place. We achieve this by relocating animals, replanting forests, and protecting the park’s animals and landscapes from threats. 3) Science: By studying how all the parts of Gorongosa’s complex web of life fit together, we make informed conservation and management decisions. We are building a new science research center and attracting scientists from around the world to study here. We are also conducting annual biodiversity surveys to catalog the diversity of life in Gorongosa. 4) Community: By providing assistance to farmers, educational programs, and health care, we improve the well-being of local communities, thereby gaining their support. Our EcoHealth program trains local people on providing health services and conducts mobile health clinics in remote regions. Our Community Education Center brings local children to Gorongosa to teach them about preserving our planet. 1) Visit the Park: You will not only get to experience what a special place Gorongosa is, but you will be directly supporting our conservation projects and giving jobs to local Mozambicans. Plan your visit. 2) Support a Project: Donate to one of the many worthy projects happening on the ground. 3) Share your story: If you have visited Gorongosa in the past, share your story, photos, and video with us. 4) Stay connected: Follow us on social media and our blog.